Introducing your baby to other foods can be fun. The simplest approach is to continue your usual breastfeeding pattern and let your baby join you at family mealtimes. He will be able to learn about new foods gradually and in his own time. Your baby will begin eating solid foods according to his own unique timetable, just as he will walk and talk when he’s ready. Readiness to try new foods is just another developmental step and it isn’t necessary to do anything special. It is more a question of waiting until he is ready and then having suitable foods available for him. 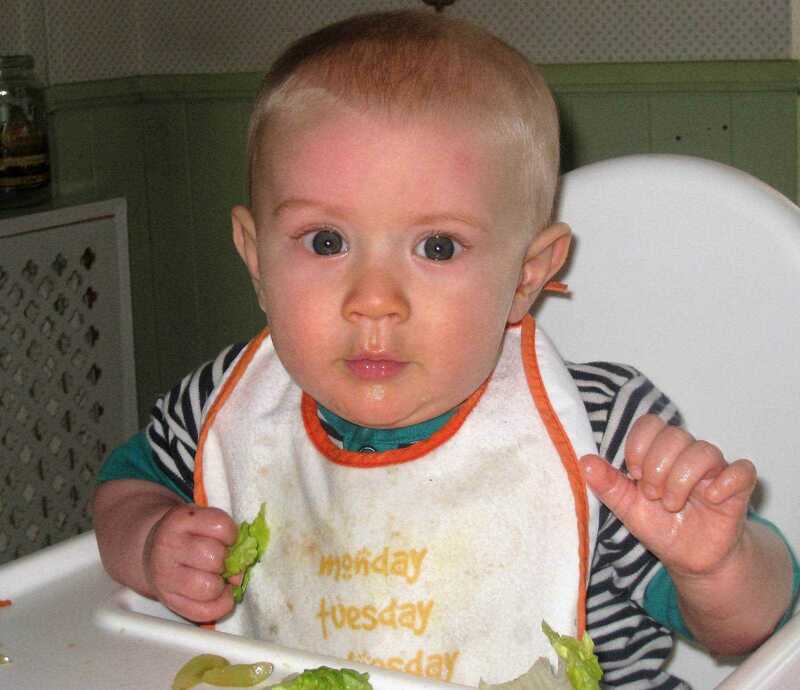 Most babies show signs of readiness for solid foods around the middle of their first year. For a healthy, full-term, breastfed baby there is usually no reason for adding other foods or drinks before then. The most important sign of readiness is the ability to sit up unsupported. 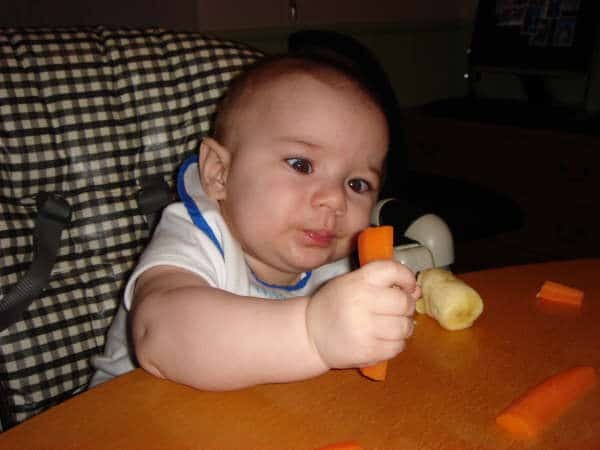 Once your baby can do this, see if he picks up food from your plate and puts it in his mouth. The Department of Health recommends exclusive breastfeeding for the first 6 months of life and states that it can continue to benefit your baby along with solid foods for many months after. Every day you breastfeed makes a difference to your baby’s health now and in the future. The World Health Organization strongly recommends exclusive breastfeeding for the first six months of life. It states that from six months, other foods should complement breastfeeding for up to two years or more. Why follow your baby’s cues? Breastmilk is the most important food in your baby’s diet during his first year, providing him with most of the calories he needs as well as fluid when he is thirsty. 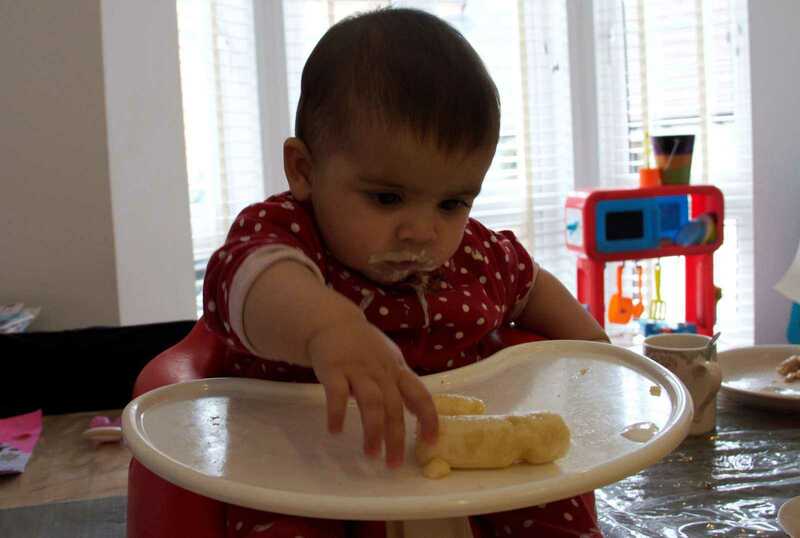 When you introduce solid foods he will start by exploring tastes and textures, practising the skills needed for later, when solid foods gradually replace breastmilk. Some popular first foods have fewer calories than breastmilk so offering large quantities of solids before or instead of breastfeeding may reduce a baby’s intake of milk too rapidly and lead to poor weight gain. Your baby’s digestive system gradually matures during the first six months. Introducing solids when he is developmentally ready means he will be able to eat and digest these new foods.Mothers of babies born prematurely often report their babies are not interested in solid foods until later than six months. Speak to your prem baby’s healthcare team regarding his individual nutritional needs. Breastmilk gives your baby protective antibodies. Exclusive breastfeeding for the first six months helps to prevent harmful bacteria, such as E.coli, growing in your baby’s gut. Replacing your milk with solid food too early reduces the level of protection he receives. 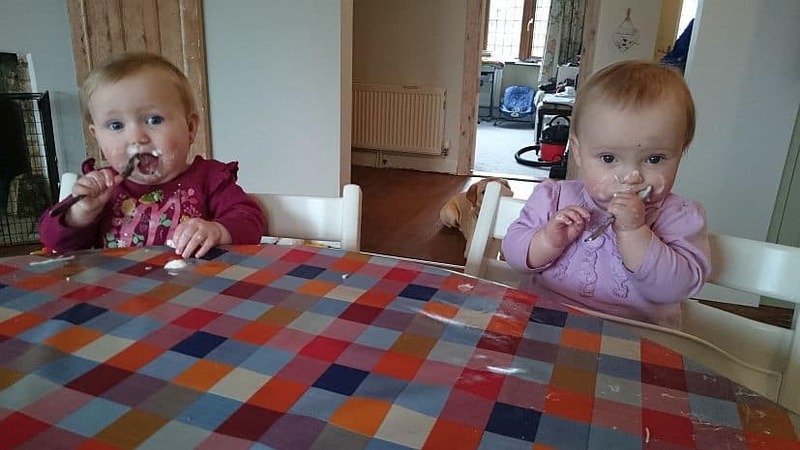 In families with a history of allergy, introducing solid foods early (while a baby’s digestive system is still developing) has been linked with allergic reactions such as asthma, eczema and food allergy. A baby susceptible to allergies may refuse solid food until he is older—this could be a natural protective reaction in sensitive children. Many babies do well on human milk alone for well beyond six months. Continuing to breastfeed alongside the introduction of allergenic foods is also thought to help prevent reactions. Exclusive breastfeeding until around six months followed by gradual introduction of solid foods may allow breastfeeding to delay the return of your periods, which in turn helps to maintain your iron levels. Your baby may ask to breastfeed more yet still not be ready for solid food. He may just be having a growth spurt, teething, feeling unwell, or reacting to some kind of stress. Ensuring that your baby is offered both breasts during each feed may be all that is needed. A baby is interested in everything his mother does, so watching you eat does not necessarily mean he is ready to start eating solid foods. Waking at night is normal behaviour for a baby and is not a sign that he is ready to start other foods even if he has previously slept for longer periods. Starting solid food is a new experience for your baby and is about taste, texture and learning new skills, not about replacing your milk.Continuing to breastfeed freely while he learns to eat other foods helps ensure he gets the nutrition he needs. Your baby is also more likely to try something new if he isn’t too hungry—he may refuse solids when he really wants to breastfeed. Remember that he isn’t likely to eat very much to start with. Sometimes a mother can feel pressured into limiting breastfeeds so that her baby will take more solid food but this can have the opposite effect. If your baby is happy and content after a breastfeed he may be more open to the idea of trying some new foods. Introducing your baby to family meals is a gradual process. Continue breastfeeding your baby as usual and simply sit him with the family at mealtimes so he can take part and explore food. Breastmilk gradually and gently introduces a baby to the foods that his mother eats because traces of those appear in her milk. This gives him a variety of flavour experiences in a natural way, helping prepare him for the foods he will eat at the family table. Babies want to eat whatever food is on the table so this is a good time to review the whole family’s diet. Babies love to use their hands, so offer foods that your baby can easily hold and put into his mouth. Until he has developed a pincer grip he can’t pick up small pieces of food. Offer big chunks of food that he can hold in his fist and gnaw. Softer foods can be spread on unsalted rice cakes, or dipped into with a suitable piece of food so your baby can manage them himself. 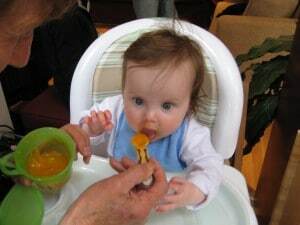 For tastes of soup, yoghurt or porridge, offer your baby a spoon with a small amount of food on, or let him dip his fingers in and lick off the food. You don’t need to purée foods or even mash them. Puréeing often requires liquid to be added, diluting the nutritional content. Offering a range of textures at the start can also prevent a baby refusing to eat lumpy food later on. The easiest way to make sure that your baby receives a range of nutrients and vitamins is to offer foods from the different food groups each day, and a variety of foods within each food group over a week. Let your baby choose which to explore and taste. Start with small amounts and increase them as he asks for more. Your milk gives your baby a sound nutritional basis, so you don’t need to worry too much about balancing his diet of other foods whilst he is still having lots of breastmilk. Aim to offer tastes of a variety of healthy foods in as close to their natural state as possible. Given access to a range of food groups, your baby will show you what he needs. If he doesn’t want a certain food, try something else, but do offer it again. You may need to offer a food frequently enough for it to become familiar before he actually eats it. Some babies accept new foods more easily when mixed with one they are already used to. Others like each food served separately. You will soon learn your baby’s preferences. Plan for a little mess! Solid foods are another part of the world your baby is exploring and he will do this as much by touch and smell as by taste. This can be messy, but is an important learning experience for him. To make cleaning up easier, roll up his sleeves, use a bib or apron and put a clean plastic cloth on the floor so you can safely re-offer dropped foods.At first most of the food he puts in his mouth to taste or gnaw may come back out again. But he will soon learn to move food to the back of his mouth and swallow it and you will notice food actually being eaten. Most babies have a good gag reflex, which protects them from attempting to swallow anything they can’t cope with. 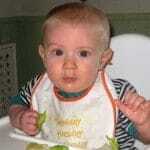 Your baby is less likely to choke on food if he is sitting upright and feeding himself. At first, you may want to check your baby’s mouth for unswallowed food after a meal. Certain foods are a choking risk for children under three years of age, including whole grapes, whole cherry tomatoes, popcorn, large amounts of peanut butter and any food that could break off in large chunks, such as raw carrot, hard apple or celery sticks. Nuts are a choking risk up to age five years. Never leave your baby alone with food or when he is eating. This post looks at research that shows baby-led weaning is not associated with an increased risk of choking. Allowing your baby to take part in family meals will let him show you when he is ready, especially if he isn’t interested at first. 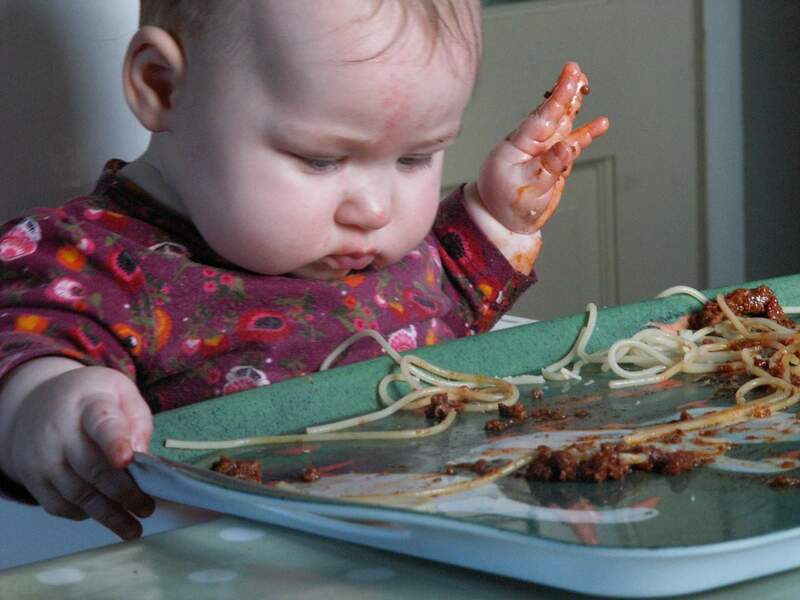 Even babies who eat lots at first can lose interest later. Don’t worry. Just offer more of any food if he ‘asks’ for it and stop when he doesn’t want any more. A baby who is allowed free choice of good, nutritious foods tends to balance his own diet.If he refuses food, he is not rejecting you or your efforts. He may simply not be hungry. If he is ill or teething, unrestricted breastfeeding will ensure he receives good nutrition and will comfort him until he feels well and interested again. Fresh, natural foods served with minimal preparation are best for all the family. Nutrients are lost when fresh food is stored for long periods of time and when food is processed, for example peeled, cooked, or tinned. Processed, low-fat or ready-prepared foods are not suitable for babies. You don’t need to buy ready-prepared baby food. These foods are expensive, often come in over-large portions and may contain added ingredients your baby doesn’t need. If you choose to buy convenience foods, check labels carefully. Start with foods that are high in energy, iron and vitamin C (to help iron absorption). Many of the foods listed in the table are rich in vitamins and nutrients. If necessary, bake, steam or cook in water. Take out a small portion for your baby before adding any salt or sugar to the rest and allow it to cool to a suitable temperature. Offering finger foods avoids the need to add extras your baby may not be ready for, such as milk or butter.Foods marked * can trigger allergic reactions in some babies. Avocado Give your baby a piece to hold Contains vitamins and essential oils. Chicken, Poultry, Meat Give large pieces of lean cooked meat, moisten with meat juices High in iron and protein. Fresh fruits: apple, pear, peach, apricot, plum, melon Not kiwi* or citrus fruits* Small chunks can cause choking. Give your baby a whole fruit or fist sized piece to hold. Remove skin and stones if needed All fruits contain essential vitamins and minerals. Vegetables Give fist sized chunks of lightly cooked broccoli, cauliflower, carrot etc Rich in vitamins and minerals. Avoid small chunks of raw hard vegetables, such as carrots which could cause choking. Fish* Poach in a little water (no salt) or oven bake. Check carefully for bones - Fish can be allergenic so introduce it with caution. Leave shellfish and fish that has been smoked or pickled until your baby is over 12 months. Rice, Rice cakes - Cook rice with water. Oil such as olive oil adds calories, nutrients and flavour. Spread soft foods on rice cakes - Plain, unsalted rice cakes are useful alternatives to rusks. Rice cakes Cook rice with water. Oil such as olive oil adds calories, nutrients and flavour. Spread soft foods on rice cakes. Plain, unsalted rice cakes are useful alternatives to rusks. At mealtimes offer some plain tap water in an ordinary or spouted cup. Water is fine for babies and children and it doesn’t matter if some is spilt. You don’t need to use bottles or spouted cups but, if you do, a free flow cup is better than one with a non-spill valve on which a baby needs to bite to get the drink to flow. Avoid juices and sugary drinks as they are bad for teeth. They can leave no room for nutritious foods and it can be hard to limit them once you start them. Even unsweetened juices contain natural fruit sugars and acids that can damage teeth. Avoid giving bottled water, which may have high mineral levels, and drinks that contain artificial sweeteners or caffeine. This includes fizzy and other soft drinks, tea, and coffee. Water Give small amounts in an unbreakable cup. Serve with food, if your baby wants a drink. Useful to rinse baby’s mouth clean after eating. Unsweetened fruit and vegetable juice Diluted to reduce the risk of tooth decay. Check labels to avoid sugar and additives. Lentils Soak and cook as per packet instructions Good source of protein, high in calcium and contain iron. Dried fruit Cut up larger fruits such as apricots. Apricots and prunes can be cooked in a small amount of water to make a nutritious spread. Although rich in minerals, dried fruit can stick to teeth and if given frequently can cause tooth decay even if you clean your baby’s teeth regularly. Wholegrain cereals such as oats, corn (maize) and wheat Can be cooked with water, without salt, sugar or sweetener. Choose unsweetened breakfast cereals. juices. Most cereals contain a protein called gluten, a potential sensitiser, so avoid mixed-grain cereals until you know your baby can tolerate each one individually. Pasta Easy finger food and handy for snacks. Serve plain, or with butter or grated cheese. Both contain gluten. Bread may also contain soya flour. Avoid pasta made with eggs until you know your baby can tolerate egg. Unprocessed cheese Your baby can use a spoon or his fingers. Eggs* Hard-boil so both white and yolk are solid. Source of iron. Soya bean* and products (tofu)* Soak and cook according to packet instructions. Cooked beans can be mashed to make a spread or dip. Cook all beans thoroughly. Soya and its products such as tofu are common allergens—often found in baked goods including bread. Concerned about food allergy or intolerance? From about six months of age most babies can eat most foods. There’s usually no need to introduce one food at a time, waiting a few days or more before you introduce another new food. After six months there’s no evidence that waiting until your child is older will stop them developing a food allergy. If there is a family history of allergy to a particular food, just offer those foods in very small amounts and watch carefully for any symptoms of an allergic reaction. In very rare cases allergy can cause a severe life-threatening reaction called anaphylactic shock. If your baby has a severe and immediate allergic reaction, which may include swelling of the lips, tongue, eyes or face, seek emergency medical care. Food sensitivity reactions include eczema, nettle rash (urticaria), a sore bottom, wheezing, asthma, colic, vomiting, constipation and diarrhoea. If a food causes a mild reaction, eliminate it and try it again when your baby is older and his digestive system is more mature. You may find it helpful to discuss this with your health visitor or doctor. Peanut butter*, tahini* (sesame seed paste), hazelnut butter* etc The Department of Health recommends that whole nuts be avoided until five years of age because of the risk of choking. Should be spread thinly. Only use smooth varieties. Nuts and seeds, especially peanuts, can sometimes cause severe allergic reactions. If your child or close family member has a known allergy consult your GP as it may be important to introduce peanuts sooner rather than later. Fenugreek* Often added to curries. Closely related to peanuts. Celery*, lupin flour* and mustard* Cook celery to reduce choking risk. Can also cause allergies and have to be included on food allergy warning labels. Sugar and artificial sweeteners. White sugar contains virtually no nutrients, which is why it is sometimes said to provide ‘empty calories’. It is also a major factor in tooth decay. Added sugar or sweeteners can also displace healthy foods. When checking food labels watch for other names for sugars—such as glucose, dextrose, sucrose, corn syrup and fructose. Molasses and honey are also almost pure sugar and have similar disadvantages. Processed foods that may contain sugar or artificial sweeteners include: sweets, puddings, jelly, cakes, biscuits, teething biscuits and rusks, tinned fruit, soft drinks and fruit drinks. Artificial flavourings and food colouring are unnecessary chemicals. Honey may contain botulism spores and should not be given to babies younger than one year. Shark, swordfish and marlin all contain high levels of mercury. Teething biscuits are often high in sugar. Your baby can teethe using anything hard and safe to chew on, including unsalted rice cakes or crusty bread. Salt can overload a baby’s system and too much can cause kidney failure. Highly salted foods may foster a taste for salty foods. Avoid and minimise the use of processed foods, packet mixes, crisps, savoury snacks, gravy and condiments such as ketchup, yeast extract, mustard and brown sauce. When buying convenience foods look for low-salt versions, including tinned beans and vegetables canned only in water. Foods high in saturated fats. While babies need fats in their diet, foods containing unnecessary saturated fats, such as fried foods, should be offered only in moderation. Very hot spicy food. Many babies like spicy food, but very hot spices, especially chillies, may be unpleasant for a baby. Babies who get plenty of breastmilk and are offered a varied diet may do well without supplements. However, the Department of Health recommend that all babies be given supplements including vitamins A, C and D from 6 months. This is produced when our bodies are exposed to sufficient sunlight. Wearing clothes and suncream to protect against skin cancer limits how much vitamin D we can produce. Vitamin D supplements are particularly important for babies who have limited exposure to sunlight AND for babies with darker skin colour living in the UK. Breastmilk contains vitamin D, but the levels are also affected by a mother’s skin colour and her exposure to sunlight. This is found in animal protein. Your baby will need vitamin B12 supplements if you eat a strict vegetarian or vegan diet. A healthy full-term baby has ample iron stores at birth, and these are complemented by the iron he receives from his mother’s milk. Introduce iron rich foods from six months. A premature baby does not have a good iron store at birth. If your baby was born before 34 weeks, he may already be receiving iron, zinc and vitamin supplements. Your prem baby’s healthcare team will be able to give more specific guidance regarding his individual nutritional needs. All dietary guidelines are educated guesses based on observation and research. Remember that your breastmilk has prepared your baby for the foods you have been eating. These foods are the most likely to appeal to his tastes and the least likely to disagree with him. Use this leaflet as a starting point from which to explore the exciting world of food with your baby. Waking at night is normal behaviour for a baby and is not a sign that he is ready to start other foods. Studies have found that giving a baby solid food before bedtime has no affect on sleeping patterns and does not help him ‘sleep through the night’. Research indicates that the ideal time to start solid food in terms of oral-motor developmental readiness is between six and eight months. There is some individual variation, but babies learn to chew when they are ready not because solid food has been introduced by six months. Breastmilk is your baby’s first food, and all other foods are complementary for the first year. He will soon be eating the same foods as you, but he will still need to breastfeed and this is a wonderful way for you to mother him, give him comfort and show him love. As your baby grows, your breastmilk continues to provide excellent nutrition and antibodies to help him fight off illness. It can also be a valuable source of nutrition when he is unwell and doesn’t want to eat solid food. More and more mothers are finding that breastfeeding can go on for as long as they and their babies (or toddlers) wish. The Womanly Art of Breastfeeding, Eighth edition. Pinter & Martin, 2010. Baby-led Weaning, Rapley, G. & Murkett, T. Vermilion, 2008. How Weaning Happens, Bengson, D. Schaumburg, IL: LLLI, 1999. My Child Won’t EAT. González, C. MD. Schaumburg, IL: LLLI, 2005. Starting Solids DVD. LLLGB, 2007. Breastfeeding and Human Lactation, 4th Edition. Sudbury MA: Jones and Bartlett, 2010. Iron Metabolism in Human Milk-Fed Infants: LLLI Independent Study Module #11, Griffin, I. MD And Abrams, S. MD, Schaumburg, IL: LLLI, 2008.